1487 Artemisia is young to be in charge of the kitchens at Chateau de Boschaud but, having been taught the herbalists' lore, her knowledge of how food can delight the senses is unsurpassed. All of her concentration and flair is needed as she oversees the final preparations for the sumptuous wedding feast of Lord Boschaud and his bride while concealing her own secret dream. For after the celebrations are over, she dares to believe that her future lies outside the Chateau. But who will she trust? 2014 Pip Arnet is an expert in predicting threats to healthy ecosystems. Trouble is, she doesn't seem to recognise these signs in her own life. What Pip holds dearest right now is her potential to make a real difference in the marine biology of her beloved Tasmanian coastline. She'd thought that her fiance Jack understood this, believed that he knew she couldn't make any plans until her studies were complete. But lately, since she's finally moved in with him, Jack appears to have forgotten everything they'd discussed. When a gift of several dusty, beautiful old copper pots arrives in Pip's kitchen, the two stories come together in a rich and sensuous celebration of family and love, passion and sacrifice. Kirsty Manning grew up in northern New South Wales. She has degrees in literature and communications and worked as an editor and publishing manager in book publishing for over a decade. A country girl with wanderlust, her travels and studies have taken her through most of Europe, the east and west coasts of the United States and pockets of Asia. Kirsty's journalism and photography specialising in lifestyle and travel regularly appear in magazines, newspapers and online. In 2007, Kirsty and her husband, with two toddlers and a baby in tow, built a house in an old chestnut grove in the Macedon Ranges. Together, they planted an orchard and veggie patch, created large herbal 'walks' brimming with sage and rosemary, wove borders from chestnut branches and constructed far too many stone walls by hand. Kirsty loves cooking with her kids and has several large heirloom copper pots that do not fit anywhere easily, but are perfect for making (and occasionally burning) jams, chutneys and soups. With husband Alex Wilcox, Kirsty is a partner in the award-winning Melbourne wine bar Bellota, and the Prince Wine Store in Sydney and Melbourne. Such a fantastic book by a great Aussie author! 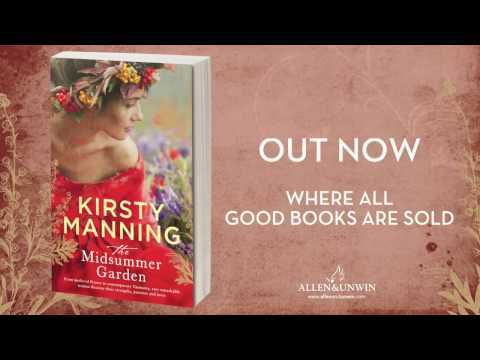 I was grateful to be given the opportunity to read The Midsummer Garden by Kirsty Manning. This is her debut book and my oh my what a book! I am going to be honest here in which if I never won this book I do not think I would have ever read/purchased this book. The reason is that I am so used to reading books in genres I like; I often ignore literature/fiction books. This is a fantastic combination of a beautiful written Australian story mixed with historical fiction. In this book we follow two main female characters Pip Arnet who resides in 2014, in Tasmania Australia and the second is Artemisia in France 1487. These two incredible women are separated by time but their love for food, nature (gardening, herbs etc), their journey towards love, reaching their goals and facing restrictions/hardships is what connects them. I was able to connect with both of these female characters, I felt for them, I cheered for them and the love of food in this book made me constantly hungry! What I loved was the input of nature, different herbs usage (from what is popular in 2014 and what was in 1487), the description of the landscape, food (yes I love food) and both of the stories connected so well together. Kirsty Manning is fantastic Australian Author (which was one of my goals to read more Aussie authors) and I cannot wait to see what else she publishes!